small block chevy in it." "make that a small block Ford if you want a real war." And then from George B. "Well, how about putting a small block Ford in a chopped up Laser...."
Sigh!..... It's hard to keep these tinkerers on topic. Well, to look at it from the perspective of popular culture, the Maser is another mashup of an icon. For the mashup to be successful, the icon must be popular and well known..... so the Maser pays homage to Laser's ubiquity. A cut down Classic Moth project wouldn't have the same effect if Classic Mothists were cutting down Banshee hulls or Force Five hulls (sorry Joe). And did I mention that this July ended as the second hottest July on record for the Mid Atlantic. I think we had four or five days near 100 degrees F. For the most part I repaired to the house and sweated. Which brings together the July heat and an example of an iconic mashup. Does this clarify how the Maser and the Laser are intertwined in iconic parody? I too have been pondering on "the end", but not in the context of aging decrepitude. I've been contemplating the death of blogs. It happens. My output in my second year of blogging has dropped precipitously. In the hyper-accelerated Internet, have I reached my apex and am now rapidly descending to the end? I have several blogs in my blog list that at one time were vibrant with daily posts but now blink feebly, like Tinkerbelle, a post coming once a month, once every three months. Am I watching the death thrall of these blogs, or even the beginning of the end of my blog? Blogs are human. They have birth, life ,death. Some blogs flame out quickly, some like Tillerman's live a long life (over six years?). Most blogs seem to have a shorter lifespan than guppies. For the blogger, blogs are time consuming, frivolous, and for most of us, despite what we think, primarily a solitary ego trip. I have installed a blog counter; it seems conveniently designed to make me feel good. One day it added 400 hits overnight. It blithely adds hits at a nice daily rate, completely divorced from the reality on how small my readership really is. But I'll let you in on a secret...... I blog for myself. As long as I can amuse myself by clicking on some old links to a "Music for Fridays" video or some arcane sailng topic, I'll keep going for the time being. Meanwhle, I better add some more posts so that I can bump July up. What will it take for you to watch the America's Cup? I read somewhere that Larry Ellison's team was to do a "video test" using conventional keelboats (RC44) and Extreme 40 catamarans in race mode. The idea was to see what camera angles worked best in bringing the action of the America's Cup to a TV audience. Some of the videos have been posted on YouTube. Of course, once they upsize to normal America's Cup lengths (lets say around 80 foot yachts or cats), these current videos with sheets of spray inundating the decks will completely go away. Another week without posting (I do have a post in the works, which in the perverse Google world, will precede this post when finished). Soon this blog will dissolve into only "Music for Fridays". House Of Fools - "Interested" from Greene Street Club on Vimeo. The late, great trumpet maestro, Maynard Ferguson, and his band plays one of his signature uptempo jazz pieces "Birdland"
I was waiting for some pictures to do a full report on the Brigantine regatta, though I did cover the much more important pre-regatta party over here . Well, George Albaugh delivered the pictures (and some video) last week. Twelve Classic Mothists attended with the three divisions evenly split; Gen2 with 4 Mothboats, Gen1 with 4 and Vintage with 4. 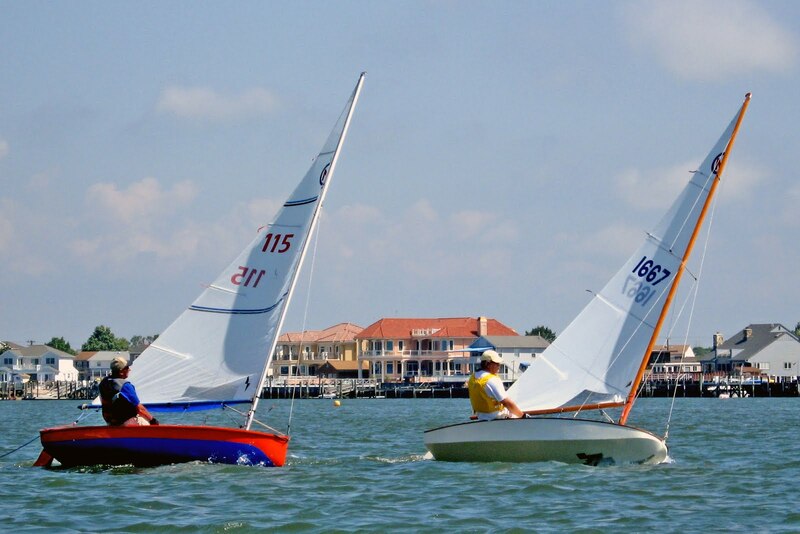 Good winds and short courses made for a quick 5 races. John Zseleczky won the overall title and the faster Gen 2 division over Mike Parson, your humble scribe won a nailbiter over Walt Collins (1 point) in Gen 1, and Greg Duncan won another close battle with George Albaugh in the Vintage division. Depending on the race, the weather mark either had a large leftie shift or a large rightie shift. Figuring that shift wasn't so much my problem (I always seemed to be coming in from the left anyway); more of an issue for me was I had some horrendous starts. 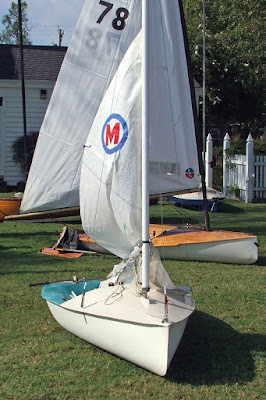 But it's all fun, especially scooting along the back side bay shore line to a gybe mark set just off the club...... where Merv's daughter was a hootin and hollerin as you wobbled into the gybe (her Dad, Merv, over 80, capsized, got towed in hanging off the transom and reappeared the next race rarin to go........Wow!). Some pics (you know the drill, click on the pic to get a higher resolution version). Pictures taken either by Ingrid Albaugh or Jesse Joyner. The top Vintage guys duking it out (George Albaugh on the left, Greg Duncan on the right). 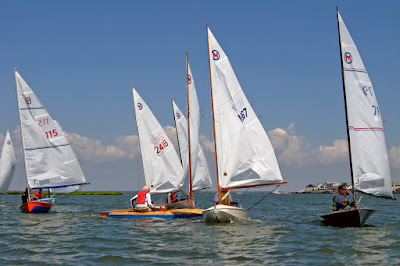 A pre-start shot with the three divisions showing; on the right, Mike Parsons in the narrow waterline speedster Gen2, just to the left of him is Greg Duncan in the Vintage Skip Etchell's Connecticut design, circa 1950, and all the way to the left is our octogenarian, Merv in his Gen 1 Maser. Walt Collin's rounding the weather mark in his Gen 1 modified, turbo charged, Ventnor knock off. And a quick video of some of the starts (courtesy of Jesse Joyner). The foreign player that the uninformed American football fan could root for: Uruguayan defensive midfielder, Diego Perez. Tireless work ethic, in-your-face defensive style, no frills, lets get on with this game. You want to sell the game in America.......... stock teams full of players like Diego Perez and Joe SixPack will start watching soccer. Most true American football fans don't revere the offensive stars as much as the tough defensive generals, the middle linebackers, the tough, eat grass, come, cross that scrimmage line and you'll pay big time..... Lawrence Taylor, Mike Curtis, Mike Ditka, Ray Lewis (sorry, I have a Baltimore bias). In soccer, Diego Perez fits the mold. The game for third place (Uruguay vs Germany) was the entertaining game. In the final, it was slow going until the extra 30 minutes. Tactically, the Netherlands had to shut down Spain's elegant short passing game. How to do that? Aggressive clattering foul after another. Slow the Spanish down to a crawl and hope for a lightening strike, which Robben almost delivered twice. However, if you accumulate enough yellows, eventually someone gets another and you are down to 10 men. That happened in extra time and Spain's finesse prevailed. I was the dude from Arkansas, except I didn't have my wife to hop over to, arms upstretched, only my puzzled three legged dog. 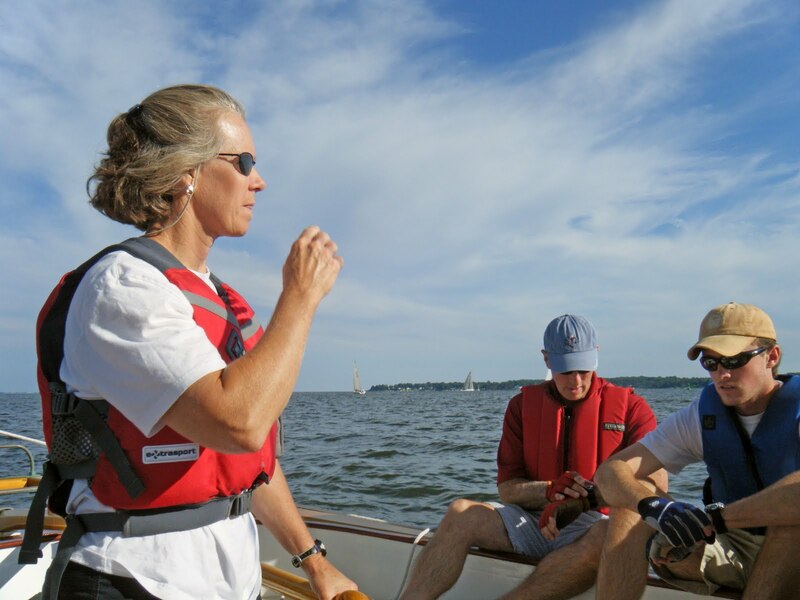 The same night I littered one of the streets of Annapolis with a Laser sail in a black bag, I received a voicemail from an old sailing friend, Susan Dierdorff Taylor, who it turns out, is now sailing director for the nascent National Sailing Hall of Fame. 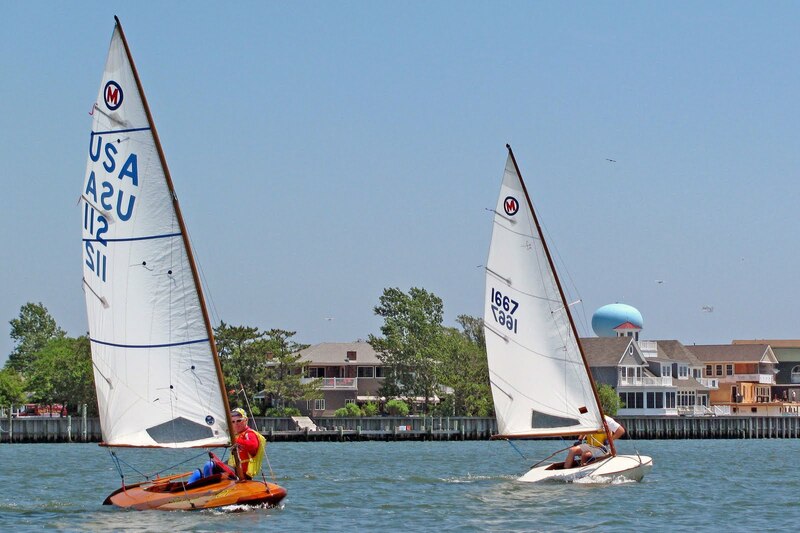 The National Sailing Hall of Fame is due to have a new building constructed on the City Dock sometime in the future but for now they have been the recipient of the largess of Peter Kellog's sandbagger program. 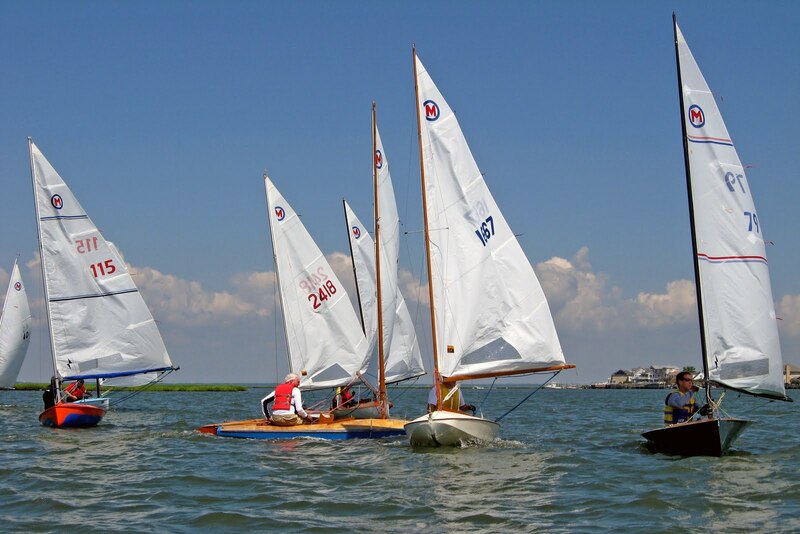 Sandbaggers were America's earliest racing sailboats; their heyday from about 1850 to 1890. 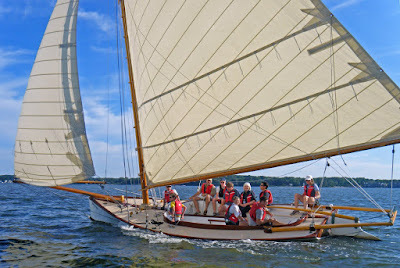 Developed from workboats that carried oysters to market, racing sandbaggers acquired huge rigs; a gaff rigged main on an absurdly long boom and a jib on an absurdly long bowsprit. To counteract the sail plan, sandbags up to 50 pounds were stacked on the weather rail and the crewmen sat on top of them. Tacking saw the sandbags flung across the boat to the new weather side. This was wild and wooly racing with many races having large sums of money wagered on them. Professional watermen manned them. The modern day Bull and Bear sandbaggers are scaled back somewhat from their forebearers, tweaked to be a little more sensible for modern times; a good thing given their purpose. They sport smaller rigs which still look enormous. They have a double bottom, their wooden blocks sport ball bearing, they have dacron sails, their masts are built with carbon rods, and the sandbags (really square water containers) are now an afterthought. Yet you still get a good feel of what it was like to race these beasts and acquire great respect for the grit and guts of these mid nineteenth century sailors. 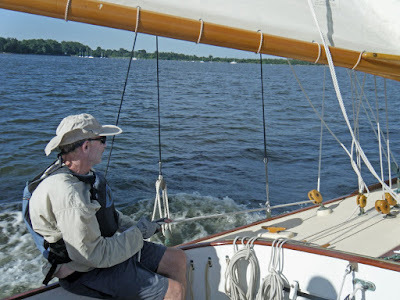 Well, to get back to my story, Susan had an invite to sail on one of the sandbaggers, an offer I quickly jumped on. 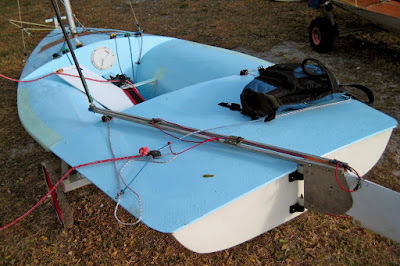 I was a little late to the dock, having discovered I was minus one Laser sail and made a hurried look see around the SSA club and streets of Eastport. However, I was able to make the push off time with my trusty Fuji camera. Sailing master, Bryan Stout, seemed most concerned that we didn't capsize and imparted some of the idiosyncrasies on sailing these traditional craft; the primary one being the jib trimmer is key! 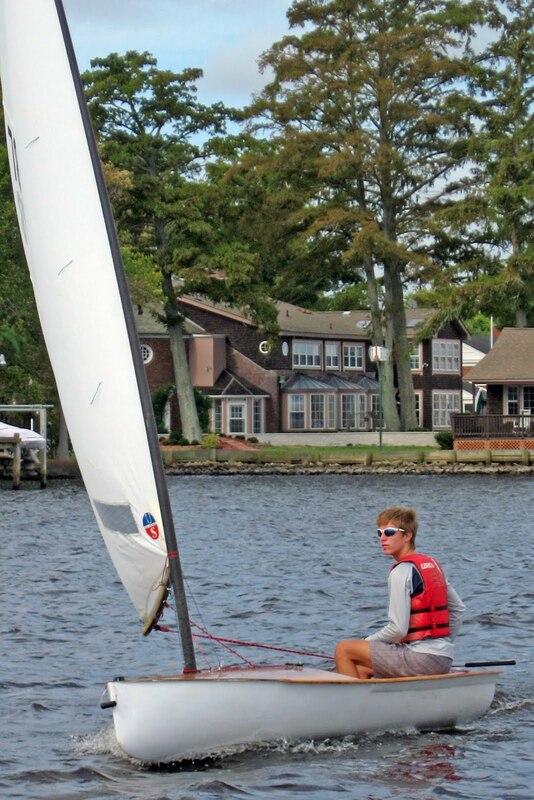 It turns out I was jib trimmer for the first half of the sail, which was on an upwind starboard tack. 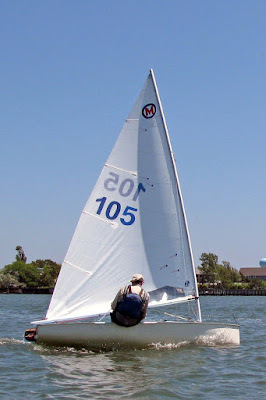 Since the center of effort of the jib is way, way forward, it will very quickly overpower the rudder and force the sandbagger down to leeward. 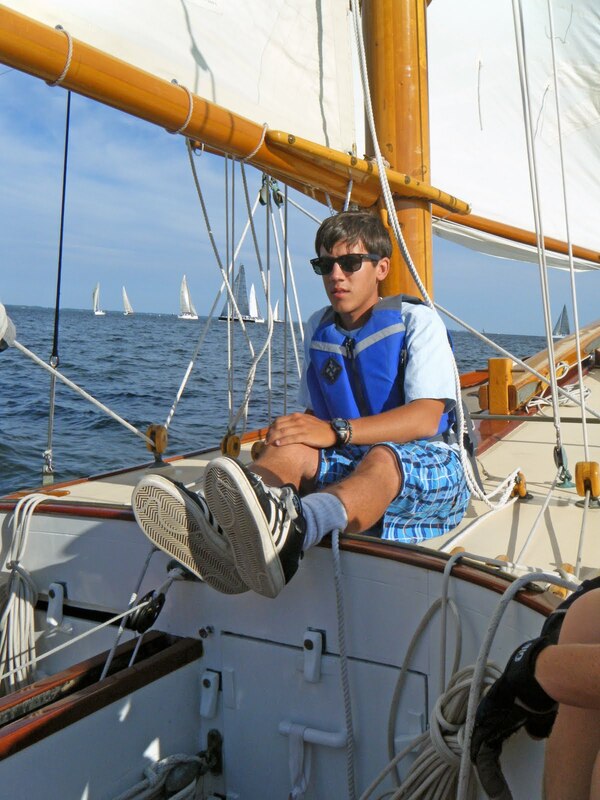 The rule of thumb was when the leeward gunwhale was seeing water; ease the jib and ease it fast! So the jib trimmer is working very hard, easing and trimming to the angle of heel and not to the jib telltales. A picture of the other sandbagger (I think we were on Bull so this might be Bear but again I may have it backwards). That evening, I climbed aboard pretty steamed about losing a Laser sail off my roof racks. After two hours on a sandbagger, it didn't seem that important anymore. What more could you ask for an evening sail? Also onboard that night were three kingpins of community sailing programs; Nick Hayes from Milwaukee Community Sailing, Doug Silber from Downtown Sailing Center, Baltimore and Lorie Stout from the newly formed Annapolis Community Boating organization. I listened to their conversations and asked a few questions which will be in a future post. Music for Fridays; The Avalanches "Since I Left You"
Fat dorky coal miner gets to show off his moves with young nubile dancers. Shameless. Always pulls in those over-the-hill males. Any video that plays off those dork vs. beauty fantasies gets them every time. As I said, if it makes me laugh, it usually makes it onto this blog. I enjoy covering the log canoe racing on this blog as I've done here and here. I know a couple of the players and usually get a blow by blow run down of the regattas as the season progresses. Sean Smith has been a regular on Island Blossom for several years. This year Bob Ames joins the crew when he can. Bob recently purchased a GoPro waterproof video camera and shot an amazing video of the first race of the season. Reports from that weekend had Saturday's wind at 5-15 with large shifts. We get to see the boardmen working hard in tough up and down conditions to keep these over canvassed craft upright. We also get to see the crew cooling off in the tepid summer waters of the Miles River. I've been told that at the 3:13 mark we get to see the squelcher's handshake. 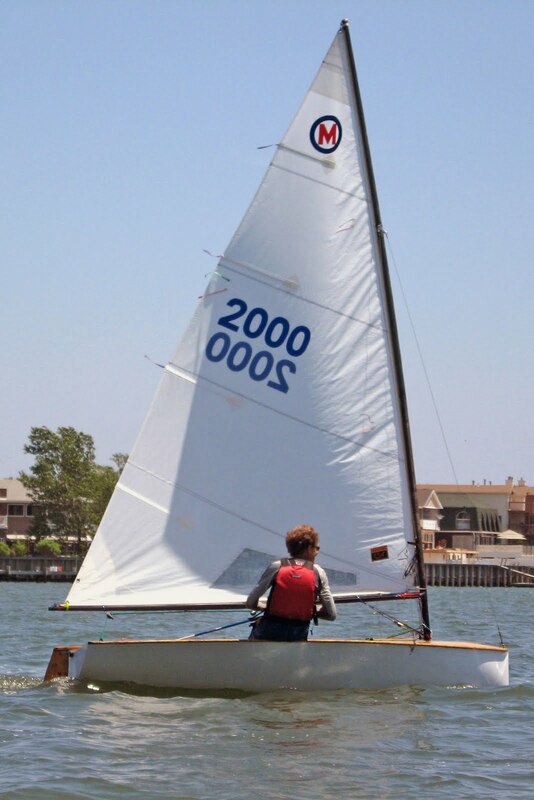 The number on the foresail is the year the log canoe was built. In Island Blossom's case it was 1892. Of course, these log canoes have been rebuilt and rebuilt over the years. These are not inexpensive to campaign for the owners. I'll have to ask what the hand signals from the jib trimmer means. Island Blossom Log Canoe from B. A. on Vimeo. As we close out the Fourth of July weekend, log canoe racing is truly one of America's enduring heritages. I haven't done any of the 2010 SSA Tuesday night dinghy series.... until this past Tuesday. Readers of this blog will know that I have been a regular with my Classic Moth at TESOD; however this year I've been a no show. To race my Classic Moth on Tuesday nights, I have to trailer it down to the club, rig it, race with the faster Lasers, derig it, and then trail it home. Having done this for two years, all that frantic dashing about doesn't seem worth it when you get spit out the back in quick order.....except in very light airs where the Classic Moth is competitive. But drifting racing has lost appeal in my dotage. And it's been very hot recently, even in the evening, so this makes the whole exercise a triple negative. Well last Tuesday, John Z offered me his Laser which sits on a dolly on the SSA grounds. Combined with the break in the scorching weather and the forecast of some breeze, this looked to be a very good evening to get some dinghy racing in. I got the Laser rigged in due order, sail up and that fancy multi-purchase vang and cunningham on, only to discover the drain plug was missing. I double checked the board bag; no plug. I called John Z and he said the plug always stayed screwed into the boat and it looked like the plug had been "borrowed". I would have to go out searching into the multitude of SSA Lasers and "reborrow" a plug for the night. Only, it turns out, the Laser can come with three styles of drain plugs and John Z's drain plug was definitely not the popular one. After going through 7 Lasers (and having to cut the ears of one plug that got stuck)..... I found a plug that fit. All this conspired to make me very late out to the race course. I joined one race at the back after I missed the start. 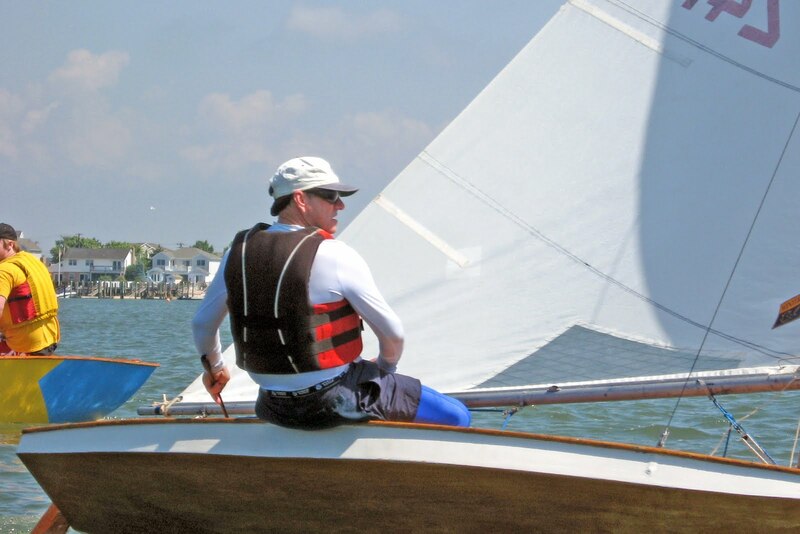 And the next start, I started next to the guy who led at the weather mark; promptly got schooled by these Laser hot shots in light air, rounded mid fleet, slopped downwind until the wind died, quit the race, and sailed for the club having never started or finished a complete race. I curse my stupidity to the high heavens! P.S Mr. ..Mrs. or Ms. Schofield; you will pleased to know your "reborrowed" drain plug has been returned safe and sound.